Sometimes on hot summer days it's best to just chill out! We recently hiked the West Palisades trail along the Chattahoochee River in Atlanta where Rocco found this nice place to cool off. 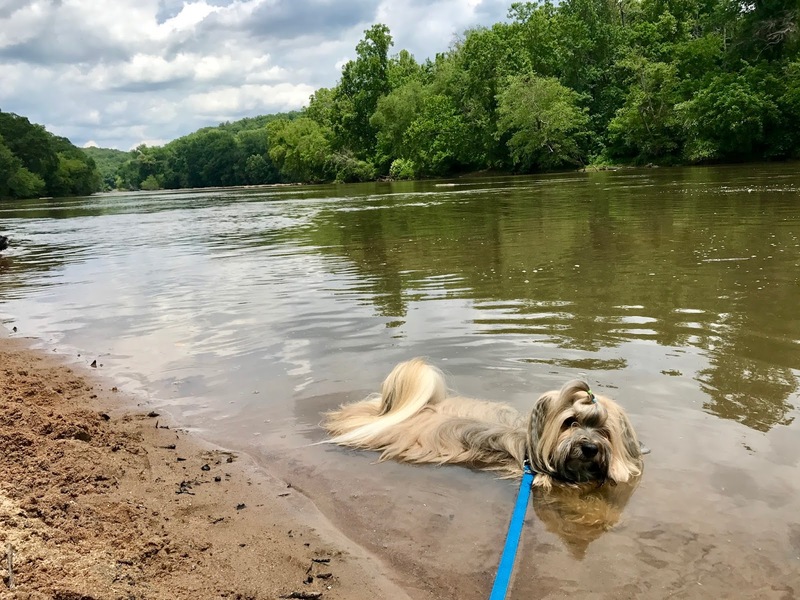 It's a nice 4-mile trail for dog walking and hiking with fairly wide paths and a soft surface with few rocks or roots to navigate. We hope you're staying cool as the summer heats up! 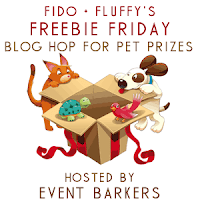 Now it's time again for Fido + Fluffy's Freebie Friday, the weekly blog hop for pet-related giveaways! If you're a blogger with a pet-related giveaway, be sure to link up! Please link directly to your giveaway, not to your home page. We post a new blog hop every Thursday afternoon at 4 pm ET. 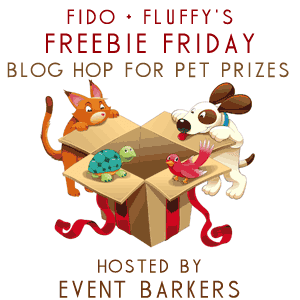 We hope you enjoy the Fido + Fluffy's Freebie Friday blog hop that we co-host with DogTipper and CatTipper! Todo está bien, estoy contento de tu blog. Gracias a admin por compartir el contenido único, has hecho un gran trabajo. Agradezco tu esfuerzo y espero que recibas más comentarios positivos de los usuarios de la web. While choosing best place online make note of the number of games provided in the website. Your dog is cute and very intelligent. Is this a hot dog? Is it me? I do not know what to do. Have a lovely cobbler. Thanks For sharing such an amazing article, I really love to read your content regularly. I read your post, really, it left me so much impressed with this article, I hope you will have more great articles to share with readers, thank you the post.Great post! Your blog is awesome, thanks so much and keep up the great work! All the students who are looking for a case study assignment help, please pay attention. My Assignment Services is a destination that thousands of students turn to when they are in need of an expert consultation. The team of experts delivering assignment help to the students are either master’s degree holders of have PhD doctorate. Therefore, every assignment that we have ever written is of supreme quality and international standard for global competition. Students who are searching for companies with “who can do my assignment for me, My Assignment Services is your destination. We have an expertise when it comes to writing original and unique answers and deliver the work under strict deadline on time. The assignment help melbourne with us is a service prepared keeping in mind the needs of the students. An affordable assignment provider from best experts is now available! Thank you for the information provided. Its quite beneficial. However, I would like to share some experience about an Australian Assignment help company that is famous between students and goes by the name Online Assignment Expert. So, it is Australia based online assignment help company that consists of more than 4000 experts. And luckily I am one of those professional academic writers. When you will visit our website, you will realise how much we are focused on providing best quality assistance to students globally. For students, who feel the need of external assistance in their academic assignments, Online Assignment Expert has always been their first choice without a thoug, and we have never let them down. We have been consistent about providing best online assignment help in australia and around the globe and at most reasonable price. Any student who feel the need of urgent samples that could help them on their course study, can visit our website and download samples on various subjects. With a team that does extensive research on every assignment and uses Quality check System to assure best quality, industry’s quality standards have been set high. In case any any student across the globe feel an urgent need to Nursing assignment help preparation, can visit our website and contact our executives or simply write us at contact@onlineassignmentexpert.com .